My loves, in the left corner you’ll find Twelfth St. by Cynthia Vincent’s daring Daryl Zip Wedge Sandals; in the right corner you’ll spot Steve Madden’s tantalizing TRACKKS. Though the zipper adorning the majestic Madden pair is exposed goldtone, as opposed to the hidden zipper featured on Vincent’s versatile original; for just $89.95, in comparison to the couture $375.00 price tag of the Twelfth St. treasures, they are just as covetable – and come in two tantalizing colors (black and cognac) that the frugal fashionista will find herself unable to resist! Thanks to Shopbop and Steve Madden for the pictures. bravo, steve madden! this is a stellar version of the original cynthia vincent beauty which i adore. You have done it again, CF! Both pairs are totally gorgey. I am intrigued by the cognac pair... Gonna go check'em out! you know, I really liked the exposed zipper! I definitely prefer the Steve Madden ones. They're amazing. Love them both, but for the similarities and the price, I am opting for the Steve Maddens for sure! To be honest, I'm just not a fan of that look. But if I have to choose I'd pick Steve Madden. 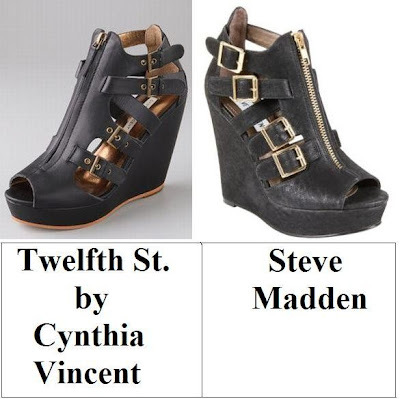 The Steve Madden shoes are lovely, but I think I'd have to splurge on Cynthia Vincent, but definitely well worth it. My heart's with the Cynthia Vincent pair - they are so sleek and pretty! ooooh!! i love love love these shoes!! I actually prefer the Steve Madden's. I really like the exposed zipper on these! totally in love with the Steve Madden shoes. WOw i want the Steve Maddens! Hello again Erika my love! I wouldn't mind having either! I adore a good chunky heel. i wish i could get away with shoes like that! P.S. I am loving puffy-sleeeved blouses right now too! Wow. Those are so similar. What an incredible find. I got the CV's on sale in an act of God. Otherwise I would have jumped on the Madden's in a moment! I like the steve madden ones. brilliant shoesies!!! aaaaaa me want! i want those to the right. they look soo good! hope youre having a wonderful week darling you! busy working? im so ready for the weekend now.. They're both fabulous! But I think I prefer the steve madden pair because of the bigger buckles and exposed zipper. I'm loving zippers right now. Great pick, Erika!! these are my favorite posts of yours! always perfect alternatives to something pricey! gives me hope. haha. Cynthia Vincent designs some really killer shoes. Oooo I love Cynthia Vincent - the wedges never fail! Splurge for sure on this one! I've always loved Steve Madden, and these are no exception. LoveLOVE these shoes! I might actually like the Steve Maddens better... Am I even allowed to say that? I actually like the SMs more. Are they suede? They look like suede in the pic..
That Steve Madden. Some of my favorite shoes are SM. wow, this is definitely a steal! definitely going for the thrify option:) as much as i love cynthia vincent shoes, i don't think i can resist these steve madden pair. thanks for sharing! I am running NOW to get those Steve Maddens - like them way better with their chunkiness!! Thanks! ps i have a giveaway on my blog. come on by and enter!!! I actually think I like the Steve Madden pair better. I might need to get these!! Totes loving the Cynthia Vincent's!! Although..the Stevies are def not a bad alternative if on a budget - great find doll!! the steve madden pair is a no brainer!